Leman Bleu deploys LiveU technology. Hackensack, NJ, January 2016: LiveU has announced that Swiss station Leman Bleu has deployed a range of LiveU technology, as well as multiple iPhone 6Ss, to bring a previously unobtainable level of dynamism to its coverage and exciting new ways of working. Leman Bleu began broadcasting 20 years ago, but the last 18 months – and particularly this year – have seen a sea change in the way it operates. 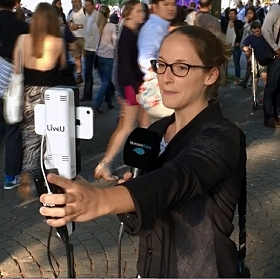 2015 saw the broadcaster adopt iPhone 6S technology, used by its reporters for capture. Initially turning to LiveU shortly after the launch of the company’s LU500 backpack, the broadcaster has expanded its LiveU use to include the ultra-small LU200 unit as well as the LU-Smart mobile app and SmartGRIP device. The SmartGRIP holds a rechargeable battery allowing broadcasters to broadcast live from a smartphone without the limitations of a short-lived cellphone battery. The SmartGRIP also includes a 3G/4G MiFi channel (or any other mobile hotspot), which is bonded together with the smartphone’s internal 3G/4G connection to combine two cellular connections. The broadcaster is also using LiveU Central, LiveU’s unified management platform for easy preview and remote control. Leman Bleu concentrates on news, specialising in politics and sport. Journalists focus on Geneva and the surrounding area. Leman Bleu has been broadcasting since 1996 with potential viewership of approximately one million people in French-speaking Switzerland and nearby French departments. Since May 2011, it’s available on TNT cable TV, SwisscomTV, UPC Cablecom and through live online streaming at www.lemanbleu.ch.